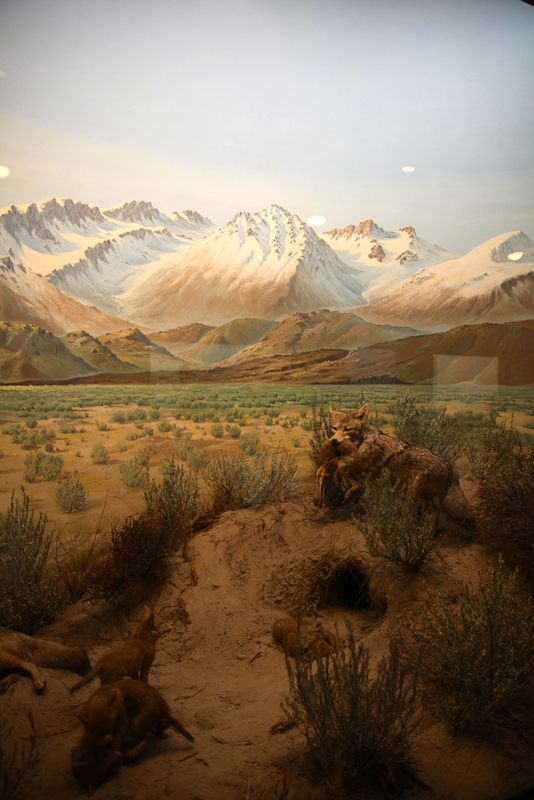 The Coyote group at the American Museum of Natural History in New York has a background painting by James Perry Wilson, and is absolutely breathtaking – especially the difference in the transparencies and surface of the still pond int he foreground and the river behind – See: https://natchard.com/2012/02/09/dioramas-2/ The Coyote diorama at the Natural History Museum in Los Angeles is pretty carefully made. Like many of the L.A. dioramas the background appears much more scenographic than the ones in New York. I could only find a single photograph – I will have a search and see if I also took a stereo pair and will post it later if it exists.